You can buy this product for a fraction of what you would pay at TAOS store. I'm a fan of the product, very close smooth shave. My boyfriend is really picky with his scents. Lemon is his summer fragrance pick. I bought this for him. He has sensitive, dry skin which and with a rough beard that combination leaves irritated skin, red bumps and ingrown hairs. Almost immediately, after his first use, it cleared up the problem! He loves it and says his razor glides over his face, making shaving almost enjoyable (at least, not a task).Not only does he like the product, but I love it! The lemon is a wonderful summer smell. He prefers the Sandalwood in the winter! I have been using this product for about a year now. 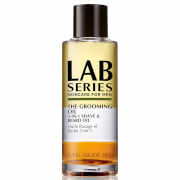 It has helped me get rid of all of the iritation that I used to experience with shaving. I love the lemon scent. It is very refreshing and nice to wake up to in the morning. It also helps with my oily skin. Great product. Won't shave without it.